Today was the "real" solstice for this area. 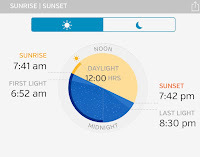 Equal day and night according to Weather Underground. 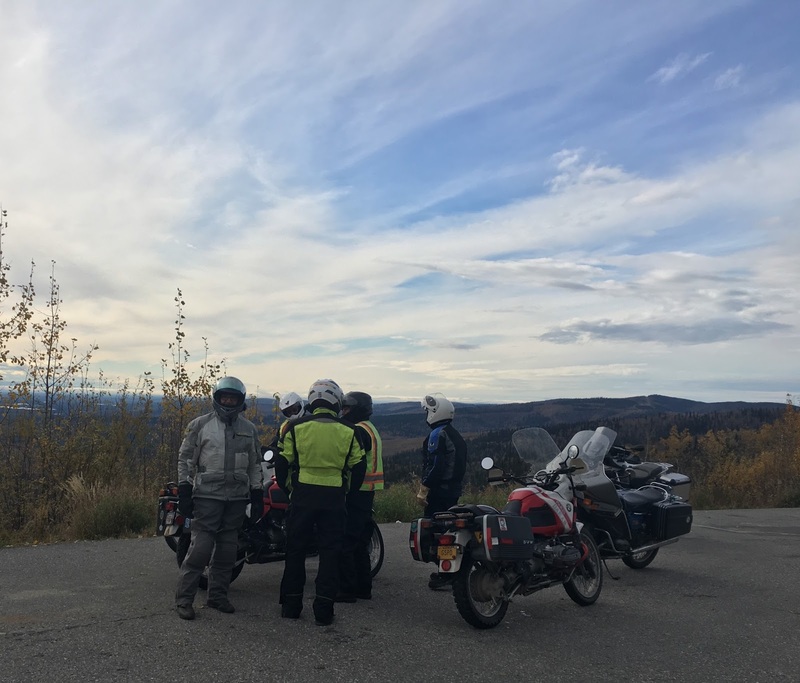 So it seemed like a good day for the BMW riding group here in Fairbanks to schedule a "1st last ride of the year". There have been some years when they've made it to the 5th last ride but somehow we don't expect that to be the case this year. Note, I thought about taking the BMW but the Ural was the easier option. We left College Coffeehouse heading out the Parks Highway towards Nenana. The goal was the Monderosa Bar & Grill just this side of Nenana. 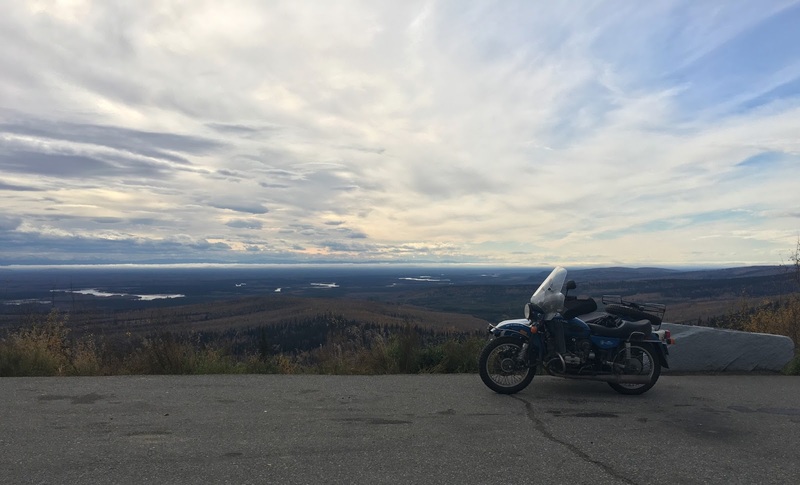 Once you climbed into the hills, the temperature warmed up to about 45°F (7°C) but once we dropped down towards Nenana, the temperature dropped to 34°F (1°C). These temperatures are according to my OAT installed in the windshield. This is the view from the Parks Highway Monument looking south towards the Tanana River and the Alaska Range. 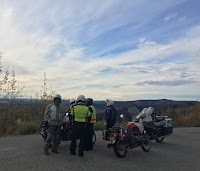 Originally, I was just planning to stop and take a photo but the group decided to stop and try and troubleshoot an electrical problem on a R100GS/PD. The fuse for the tail lights/dash lights keeps blowing while riding. I suspect multiple broken wires in the bundle from the headlight to the handlebars. I offered to take the troublesome bike off his hands for $20 but he didn't take me up on it. BTW, the bike with the electrical problem is the red/white one in the foreground not the other red/white R100GS/PD that most seem to be looking at. Had to look up OAT....had a similar issue with the wires going from left turn signal to headlight bucket on the R80, didn't find the break, pulled the wire up some to move the break past whatever metal it had been touching, fine since then! Really and truly had electrical gremlins. These bikes are getting old and the insulation on the electrical system is getting hard and brittle. Electrical gremlins such as these show seem to show up often if the bike is actually ridden. I think it was near (or past) the lower temperature limit for some but I think that most enjoyed the ride. I know you don't like them but a windshield really helps at colder temperatures. I'm thinking it should be the End of the Season/Year Ride. Last ride sounds just so final, to me. A better choice of words but that's how it was advertised on the email list. Hmmm wonder how many last rides you will have this year. At least they didn't have to look at the Ural as the one with electrical issues.....that is a good thing.